'At its most visually lavish moments a film very easy to be impressed by'. 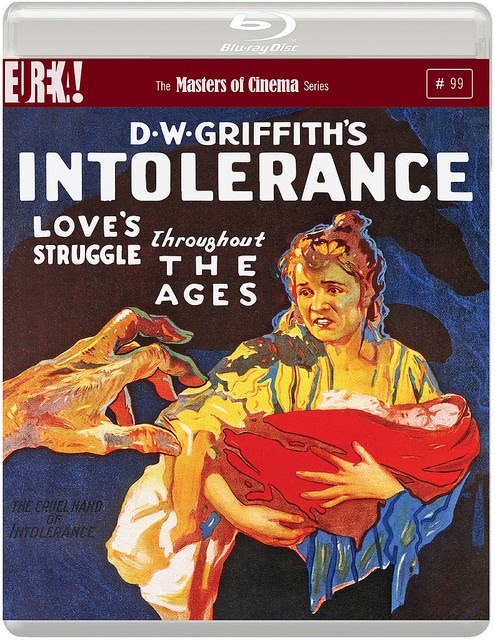 If nothing else, D. W. Griffith's Intolerance is certainly at times one of the grandest filmic spectacles you're ever likely to experience, with complex scenes featuring colossal sets and hundreds of extras on a par with the most magnificent cinema offered by later epics and still awe-inspiring today. It's not hard at all to accept that this was by far the most expensive film that had ever been made at the time of its original release in 1916. Griffith's vision is regularly matched by his ability to realise these monumental images, making Intolerance at its most visually lavish moments a film very easy to be impressed by. Elsewhere, however, Griffith struggles with the immenseness of the narrative task he sets himself. 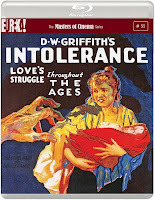 Intolerance relates a quartet of stories from across history: the first focuses upon The Boy (Robert Harron) and The Dear One (Mae Marsh), a couple struggling through the trials of life in America in 1916; the second tells the story of the persecution of Jesus Christ (Howard Gaye) leading to his crucifixion; the third shows the St. Bartholomew's Day Massacre of Huguenot Protestants by Royalist Catholics in Paris, 1572; and the final story focuses on the conflict between Babylonian Prince Belshazzar (Alfred Paget) and Persian leader Cyrus The Great (George Siegmann) in 539 B.C. The director switches between each of the four narratives continuously throughout the film, the idea being that each story complements the other in showing the timeless nature of intolerance within humanity. It's a novel concept, but one which Griffith is only partially successful in bringing to fruition. At times the structure works well, especially during the film's closing hour where the director continually quickens the pace of his cuts from one story to another. At others, however, the connecting threads between the separate stories don't feel nearly strong enough; Griffith even overtly points out the supposed parallels through his intertitles on a few occasions, as if the director himself isn't entirely convinced of his own concept. The other issue is one of balance. There are two narratives here - the 1916 story and the Babylonian story - which receive far more attention than the other two, and you will find yourself as Griffith's film wears on thinking that, had either of these been fleshed out into their own discrete film, they probably would have ended up more successful than both their individual presentation here and Intolerance as a whole. Come the film's conclusion, I couldn't help but feel that the sections focused upon the Crucifixion and the St. Bartholomew's Day Massacre added very little to the overall experience. In fact, in choosing to tell four stories rather than just one or two, Griffith forces you to keep track of far more characters than you either want or need to, making his film a more arduous task than it could have been. 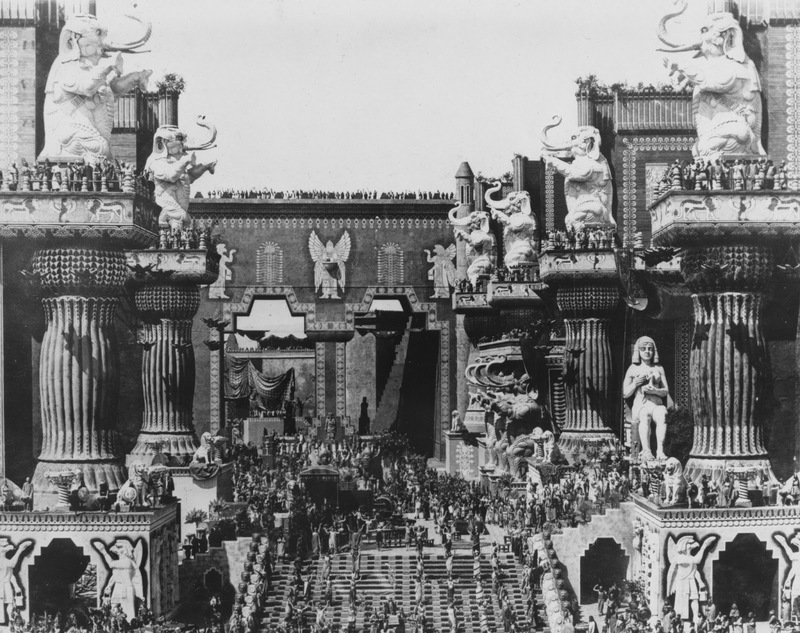 Intolerance ultimately manages to justify your attention through its aforementioned cinematic grandeur, most of which can be found within the Babylonian narrative - the battle between the opposing armies of Persia and Babylon is undoubtedly the highlight of the film, presenting a truly magnificent screen spectacle. But there's an awful lot of far less successful cinema here that you'll need to prepare yourself to contend with in order to enjoy the good stuff. At close to three hours in length, I for one certainly wouldn't blame you for choosing to watch a fair few other classics of the silent era before getting round to tackling Intolerance.